Millets like Varagu/Kodomillet,Ragi/Fingermillet,Kambu/Pearl millet, Samai/Littlemillet, Thinai/Foxtailmillet,Kuthiravali/Barnyard millet are often cooked at my Gradma's place when i was young. My grandma make Kamba koozhu aka pearlmillet porridge and Ragi Koozh/Fingermillet porridge every week to feed her labours. Obviously i have been pampered with millets from my earlier ages. She makes South Indian savouries like murukku, thattai with millets and sweets like millet balls quite often to feed us whenever we go to her place. Actually i have been introduced to variety of these incredibles grains only at my Grandma's space, back home mom makes food only with fingermillet and pearlmillet either as adai or simli a delicious sweet balls prepared with ragi millet, apart from that she never cooked anything with millet. When i came to know the health benefits of these grains, i searched for them here in Paris. Only Foxtail millet is available in Orangic stores and they arent expensive. Thank god i went to India last year, do i need say how many kgs of millets i bought there, yea i came back home with varieties of millets and i cook with them quite often. Coming to today's recipe, this varagu aka Kodomillet bagalabath is one of the easiest and definitely a nutritious,super filling meal suits prefect for a lunch while its too hot outside. 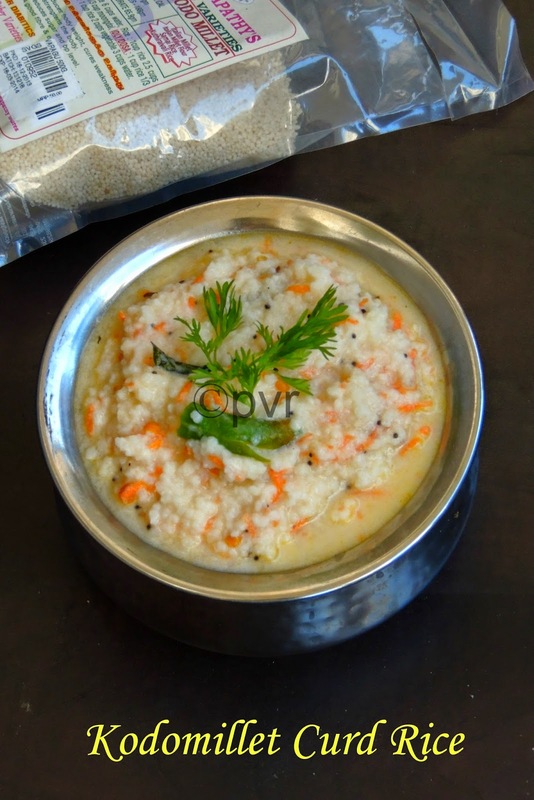 Kodomillet tastes absolutely incredible if they are prepared this way and this curd rice goes for simple preparation. I used grated mango, grated cucumber, grated carrot to this curd rice to give them more colour and taste, if you love fruits in your curd rice just add couple of fruits like grapes,pomegranate seeds etc. However we had this curd rice for our lunch with mango pickle. If you dont want to have rice, just replace it with millets, its advice to add millets often in your diet and i make foods out of them atleast thrice a week.This first week's theme for this month's blogging marathon is All about Millets, hence am posting this nutritious curd rice, give a try friends you wont miss the rice here.Sending to my event Healthy Diet-Healthy Lunch Recipes by Beulah of Full Scoops and Sending this post to Ahlan Ramadan-The Healthy Way.Check out the Blogging Marathon page for the other Blogging Marathoners doing BM#42. Pressure cook the millet upto three whistles, once the steam gets released, open the cooker and add immediately milk, curd,salt to it. Mash them mildly, add now the grated mango,grated cucumber, grated carrot, chopped coriander leaves, give a stir,keep aside. Heat oil,let splutter the mustard seeds, add the urad dal,channadal, asafoetida powder, dry red chillies and fry until the everything turns brown. Add the slit opened green chillies, grated ginger, curry leaves, fry for few seconds. Pour this tempering to the already prepared curd rice, mix well. That's an interesting one Priya..I have this at home, and we use it along with rice, never made a curd rice with it..very good.. Very healthy lunch. Priya you are introducing me to these millets. I have never heard of them. healthy and delicious curd rice. Looks so delicious aks, I love to have this on a carefree lunch day. Healthy and tasty millet recipe. i can eat this whole bowl without any guilt. I am a big fan of curd rice and now i trying with millets n oats...best comfort and satisfying meal...love it anytime! looks so inviting,perfect with pickle..yummy!! A beautiful, and delicious dish, but I must say that it's almost next to impossible to grate a beautiful ripe mango...unless it's green! 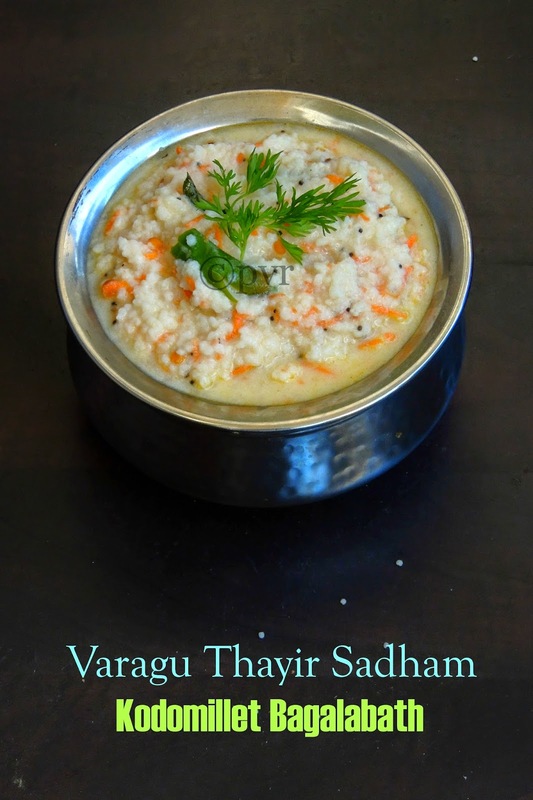 Such a delicious and healthy curd rice! Thank you for linking it to Healthy Diet Event! Such a nutritious and healthy dish. I need to lay my hands on Kodomillet. I haven't seen it anywhere here! That's one refreshine meal, priya. I prepare it similarly with rice but have never added mango to it. I'm starting to love your blog. This is a great idea and a great substitute to ordinary rice.